CD + Pure Audio Blu-ray featuring Manyworlds video by Boya Bøckmann in 2D and 3D. Norwegian composer Rolf Wallin (b. 1957) is among the most exciting contemporary composers in Scandinavia. This special CD + Pure Audio Blu-Ray release on Ondine includes world première recordings of three orchestral works by the composer performed by the Bergen Symphony Orchestra, conducted by the Finnish conductor John Storgårds. Fisher King is a concertante piece for Trumpet and Orchestra which was completed in 2011. The soloist in this recording is one of today's greatest trumpetists, Håkan Hardenberger. The work has a deeply personal meaning for the composer. According to Wallin the work is "about visiting some dark places. Low places ... But it is even more about the hope of transforming that Wasteland into brightness and abundant, flowing energy." 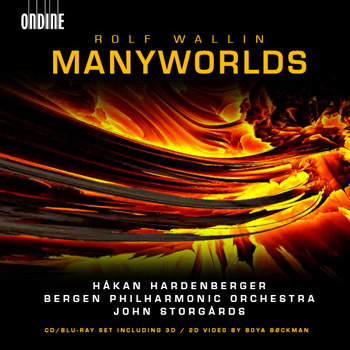 Manyworlds is an extensive work for orchestra with a duration of over 30 minutes. The work was jointly commissioned by the Bergen Philharmonic Orchestra, Helsinki Philharmonic Orchestra and NDR Radiophilharmonie Hannover. The title of the work refers to the Many-world theory in quantum physics which deals with a very large, perhaps infinite number of parallel universes. Wallin explains: "As a composer I have always thought of music as a universe in which amazing multidimensional and multicoloured sculptures can be created. In my works I have tried to create a few of the infinite possibilities." The Blu-Ray Audio disc also includes a 2D & 3D Video by Boya Bøckman based on Wallin's Manyworlds. This special release is also the first Pure Audio Blu-Ray disc to be released by Ondine.